What is Royal 3D Coverflow ? Royal 3D Coverflow is a fully 3D multimedia coverflow slider plugin that allows to display multimedia content with an unique original layout from a 3D perspective. It’s perfect for any kind of presentation, for anyone that wants to deliver a great impact to thier visitors. It runs on all major browsers and mobile devices like iPhone, iPad, IOS, Android and Windows. When a thumbnail is clicked you can choose to do nothing, display multimedia content using our great revolution lightbox or to open a new webpage. The lightbox has support for image, video (mp4), audio (mp3), Vimeo, YouTube, iFrame, Google maps and flash. 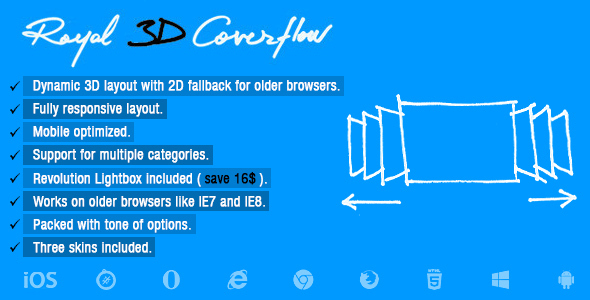 Royal 3D Coverflow has high performance using OOP code and the latest CSS techniques, ready for mobile with swipe, very flexible, easy to setup and extremely customizable.